Before our cruise, we spent a few nights at the Doubletree Grand Biscayne Bay Hotel, which is located just north of the Venetian Causeway. However, this part of town is being redeveloped, and there just aren’t a lot of restaurants. However, one notable place we did find was The Daily Creative Food Co on Biscayne Avenue, about two blocks from the apartment. 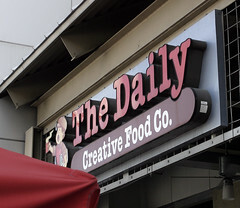 The Daily is a breakfast and lunch joint that sports an exhaustively large menu of sandwiches, salads, and breakfast items, most named after various newspapers. They also have a nice assortment of juices, smoothies, and coffee drinks. I ended up settling on the NY Diner Breakfast and a Cafe con Leche, while Carol opted for the pancakes. 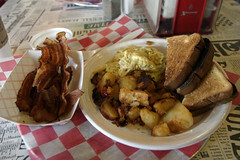 My breakfast was scrambled eggs with a side of homefries and toast. The eggs were basically just normal scrambled eggs, but the toast (nice wholegrain bread) and homefries (nicely crisped and spiced) were quite good. 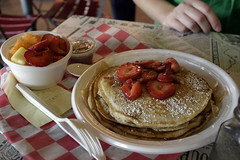 Carol rather enjoyed her pancakes, which were generously sized and had a nice texture and crispness to them. She ordered them with a fruit cup, which was one of the better fruit cups we’ve had, with kiwi fruit and some good fresh pineapple. While I don’t have pictures, we ended up coming back here for lunch, which had some very nice sandwiches. However, there were two things I didn’t like: (a) the inside is very loud due to lousy acoustics, and (b) they didn’t have a single bottle of hot sauce anywhere, which is odd for a breakfast joint. All-in-all, a decent breakfast (and lunch) and a nice expansive menu. Not a bad little spot for this part of town. About five years ago, I was exploring the area around MIT before one of my many meetings, and while ducking down Brookline Street, passed by an unassuming little storefront on the side of a fairly industiral-looking building. But looking inside, it was a little diner, absolutely filled with students having breakfast. It looked interesting enough that I vowed to come back and try it sometime. There was just one one little detail. Brookline Lunch isn’t open on Tuesdays. And, somehow, that seems to be when the majority of my visits to MIT are. So for about two years, Brookline Lunch has been on my hit list, but it wasn’t until I had a visit to MIT on a recent very cold Monday morning that I finally had a chance to check them out.